Jay Brooks posts an ongoing, and very interesting, series over at the Brookston Beer Bulletin called "Beer in Ads." 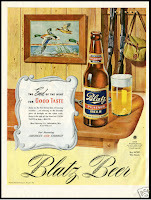 Recently he featured a poster for Blatz Pilsener Beer. The accompanying slogan is “The End of the Hunt For Good Taste.” When I saw the headline in Jay's Twitter feed I had a flashback to college. There was a lot of Blatz beer showing up in the dorm in those days. However I suspect its popularity had more to do with finances than with the culmination of any flavor hunt. Thanks for the memories, Jay. I think. By the way, the poster is from 1944. I was in college many years later. By that time Blatz was brewed by the G. Heileman Brewing Company, who obtained the label from Pabst. See this article for more information on this piece of American brewing history. See more of Jay's Beer in Ads series here.